I was having a hard time finding inspiration for this latest nail art design. I wanted to do something more than just a simple coat, but didn’t want to get all crazy either. 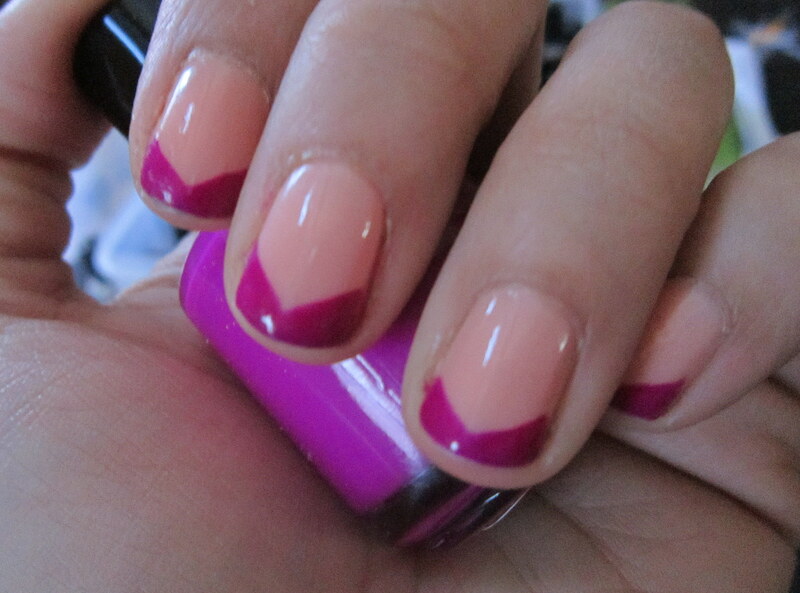 So, I found two nice spring-y colors and just did a simple french manicure, but with a twist. Instead of a straight line horizontally across the tip of each nail, I painted two diagonal stripes on the tip of each nail that met in the middle. I used Giselle by Zoya for the peach-y base color, and then Punki Purple by Nina Ultra Pro for the tips. Then a top coat and all done! Simple, fun and colorful, just in time for the spring weather! Previous postExtreme Dresser Makeover – Finally Finished!